Guns for sale on Instagram: The real problem is the law, not social media. Are Gun Sales Really “Booming” on Instagram? People are using Instagram to advertise guns for sale. But that’s not the real issue. The Daily Beast’s Brian Ries this week wrote an interesting piece about gun sales on Instagram. By searching for various gun-related hashtags, he found examples ranging from an antique Colt to a “custom MK12-inspired AR-15.” It turns out that advertising guns for sale on the photo-sharing site is mostly legal, and Instagram has no special policy against it. Predictably, gun-control advocates expressed concern, and a Justice Department official argued that Internet gun sales “underscores the need for a universal background check requirement.” The story, on the whole, was well-reported and enlightening, if not exactly shocking. After all, people can advertise guns for sale in all sorts of ways, from photo-sharing sites to email blasts to armslist.com. The popular photo-posting app—bought last year by Facebook for $1 billion—has become the go-to place for folks looking to buy and sell firearms on the Internet, boasting a web of private owners and professional dealers with shotguns, handguns and assault rifles for sale on the open market, according to a report by the Daily Beast. Except the Daily Beast never said sales were “booming,” nor that Instagram had become the “go-to place” for Internet arms sales. It didn’t really say anything, in fact, about how widespread the practice is. But that didn’t stop the ever-hyperbolic Daily Mail from reporting that Instagram is “growing in popularity as a digital marketplace for people trading in firearms.” Again, Ries’s piece was the only cited source. And again, Ries said nothing about whether the popularity of Instagram gun sales was growing, waning, or staying about the same. To make sure I hadn’t missed anything, I asked Ries via Twitter whether he had a sense of the scale of the gun trade on Instagram. His reply: “Tough to say. Some use hashtags, some don’t, some are private, some are public.” Asked about the claims of “booming” gun sales made by other outlets citing his story, Ries said, “I can’t speak to their exaggerations.” True enough. It’s not his fault that a bunch of hacks are rewriting his story to make it seem more sensational than it is. Other publications mangled the story in different ways. Gawker’s headline: “You Can Now Buy Guns on Instagram Without a Background Check.” Actually, you can’t buy anything on Instagram, because the site has no payment mechanism. You can see guns for sale on Instagram, just like you could see them on a flyer nailed to a telephone poll, but to actually buy them you have to get in touch with the seller through some other means. Whether a background check is part of the ensuing negotiation has absolutely nothing to do with Instagram. The “now” in the headline is also wrong, since absolutely nothing has changed on this front in quite some time. Factual quibbles aside, the story might still be alarming if it were true that Instagram were being used to sell guns on a massive scale. But I found no evidence that it is. Search for “#guns” on the site and you’ll turn up as many biceps selfies as weapons for sale. 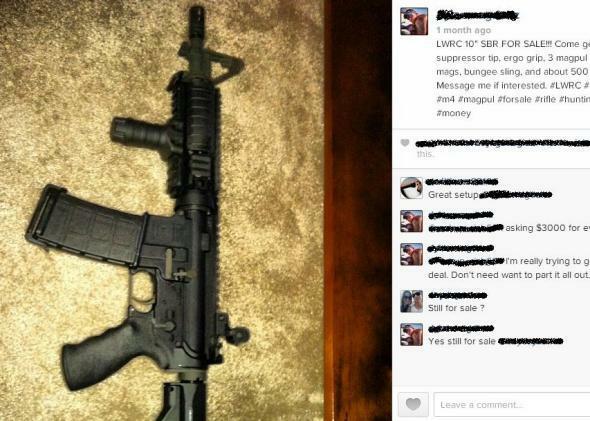 Ries told me he found guns by searching for keywords like “rifle,” “AR15,” and “glock” on the site hashb.ag, which combs Instagram for posts with the hashtag #forsale. Each of those searches turns up a smattering of posts advertising guns, but they’re spread out over a period of many weeks and months. I could not find a single search term that brought up more than three or four gun-sale postings in the past week. On a site with more than 150 million active users, that’s an infinitesimal number. None of this is to say that people shouldn’t be worried about people using the Internet to privately sell guns without a background check. But Instagram is not the issue here. The issue is the law, which leaves private, in-state gun sales virtually unregulated. As Ries noted, an effort to change that in April was blocked by Senate Republicans, despite broad public support. For some reason, the Post, Mail, et al. didn’t see fit to include that detail in their versions of the story.